Why are App Updates Important? Many people discount the importance of running app level updates on your computers. Programs like Chrome, Firefox and Adobe Creative Suite all have built it update utilities that will look for and apply critical security and functional updates from their respective development teams. Part of the job of software vendors is providing quality assurance meaning they are testing their software to make sure that it is stable and usable for their users. However little is known about how each vendor actually tests their software. Many only test on newer operating systems and many force updates regardless of what operating system you are using. This can lead to unsavory results. Results like a version of Chrome that updates and starts to slow down your computer because it was written for 10.13 but your still on 10.10. Or Adobe Photoshop automatically pushing you to move to their latest creative cloud version of Photoshop leaving old, once working fonts left unusable. In these cases what can you do to make sure that your running the latest version of software on your computer but without leaving yourself in a vulnerable position? Managed App Store featured app update view. Apple addressed this, or tried to many years ago when they released the Mac App Store for MacOS. 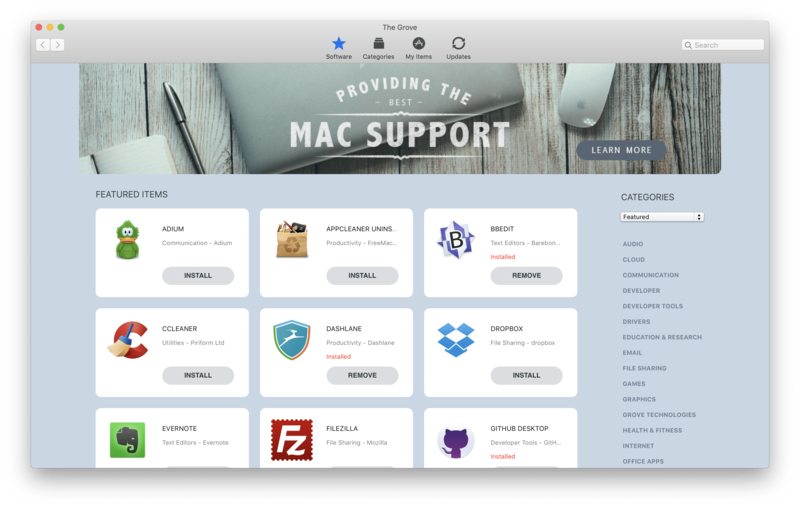 The premise was simple, any developer who distributed software, freeware or paid could distribute that to their customers via the Mac App Store for a small fee or a cut of the profits. Over time the App Store has imposed restrictions on apps and how they can function for the sake of overall security and Apple tested or vetted each update submitted to make sure overall quality of each app. That is great news! However many developers were either blocked from adding their app to the App Store if their app conflicted with a known Apple App solution. Many developers opted out because they felt the profit sharing model was too costly. And many developers simply can’t afford the annual fee required to keep up a presence on the MacOS App Store. Managed App Store category app update view. There are hundreds of thousands third-party, independently developed Mac Apps not in the Mac App Store. 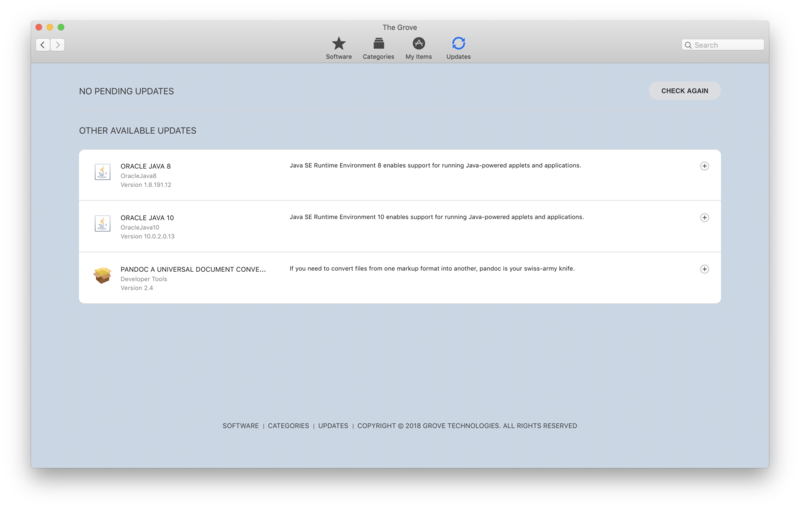 Relying on the App Store as your sole point of updates leaves you with a gap in overall app update coverage. While independent developers like Google, Mozilla, Microsoft and Adobe all push down updates in a tested and logical way; many other developers do not have the ability to offer that level of quality testing required to make sure that the App you’re installing isn’t going to cause issues on your Mac. So what is the solution? Managed App Store installed app update view. 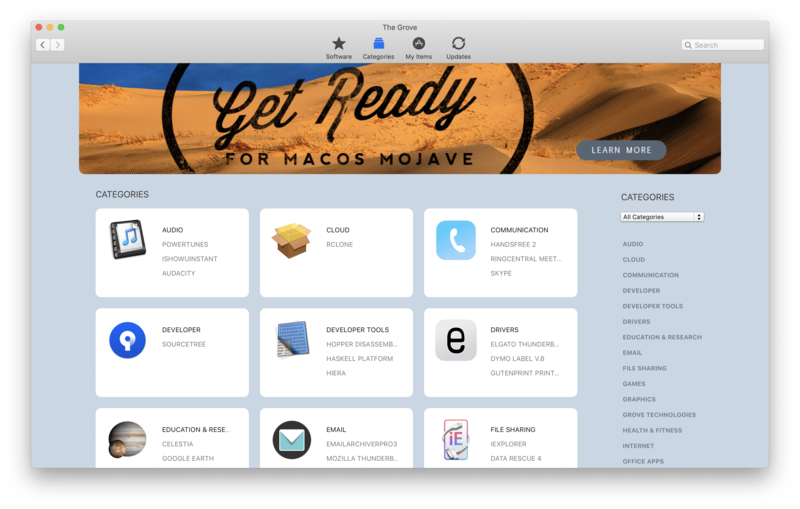 Last year Grove Technologies created the Managed App Store a curated list of over 1900+ third-party apps that we test on operating systems ranging from 10.10 - 10.14. Our system is an App Store that lists tested and safe updates that you can feel good about installing on your system. Its intelligent enough to detect what your current OS is and will only show you updates that are safe for you to install for your current computer platform. Any update that causes an error or issue during our testing will not be admitted in our Managed App Store leaving you with an app that will stay at the latest, stable, tested and trusted version. Managed App Store new app update view. Our Managed App Store is 100% secure and all updates are digitally signed and traffic to and from our update servers are encrypted. No personal information is needed, there is no Store ID or username / password needed to use the system. A small subscription fee starting at 2.99 is what we are charging for the service and what you get is access to our entire library of tested and vetted updates. The best part of our system is that it scan’s your computer and automatically suggests updates to you for software you already have installed in a non pushy way. Keeping your software up to date shouldn’t need a lot of knowledge, homework or effort. However to make sure that your Mac stay’s running as best it can be you need to be vigilant and keeping your Mac Apps updated is part of a plant for overall Mac heath and security. Many apps that are not updated can potentially leave your Mac in a vulnerable state, open to hacks and other security vulnerabilities. If your interested in learning more about our service offerings do not hesitate to reach out by filling out the form below.